Tubby and I go for a run together every morning. Depending on the weather, or how many times I hit snooze, we do up to 3 or 4 miles. I like to do a lap that goes around the White House and the Washington Monument. Tubby has always had this habit of needing to find a stick to carry in his mouth for the entire run. This is usually not a problem, except for the mornings that he picks up sticks that are so long he looks like he is training for American Gladiators. I think he looks hilarious, but the people we approach on the narrow sidewalks seem to disagree. 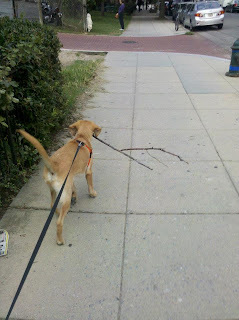 This morning’s stick was not an obnoxious size. Big enough that he felt the need to add a prance to his step to show it off, but not so big that anyone was in danger. That is, until we got to the White House. It’s the time of year where it is still dark in the morning when we run, and this morning Tubby decided not enough people were on our schedule. He decided to drag his stick along the metal gate surrounded the white house making a loud clamoring noise. The more I tried to pull him away the more he tried to lunge for the gate. When we reached the end the Secret Service men on duty had a look of concern until they saw the culprit. They laughed and said it looked the dog was trying to get the government to work. I think most Americans would appreciate Tubby’s contribution.